AUGUSTA, Ga. (April 10, 2018) – When you have diabetes then get an acute kidney injury there is a multiplier effect that can worsen your prognosis and destroy your kidneys. Now scientists have evidence that at least part of the problem is that diabetes impairs the ability of kidney cells to consume the garbage they generate in the process of filtering more than 100 quarts of your blood daily. It's called autophagy, and it helps kidney cells operate at a premium and that's where the problems occur, says Dr. Zheng Dong, cellular biologist, Regents' Professor and Leon Henri Charbonnier Endowed Chair in the Department of Cellular Biology and Anatomy at the Medical College of Georgia. In diabetes, hardworking kidney cells must work even harder to handle high levels of glucose, which produces even more garbage, while autophagy activity is down. An acute kidney injury on top of that further heightens the trash and the damage. Dong is principal investigator on a new $2.2 million grant from the National Institute of Diabetes and Digestive and Kidney Diseases that is helping parse just how autophagy is hampered in diabetes and finding targets to bolster autophagy and help patients and their kidneys better survive diabetes and recover from an acute kidney injury. An acute kidney injury is mostly what it sounds like: when kidney function deteriorates in a few hours or days. It can result from a literal blow to the kidney, in a fall or car accident, or from dehydration in an overzealous student athlete. In the face of general good health, most patients recover fully and quickly, Dong says. But acute kidney injury mostly occurs in people who already have another medical problem like diabetes. In fact, most are in the hospital when it happens, with problems like bleeding or shock, failure of other organs like the heart, even an overdose of over-the-counter nonsteroidal anti-inflammatories for problems like the cold or flu, according to the National Kidney Foundation. Despite these typically heightened scenarios, there aren't any targeted therapies for acute kidney injury, says Dong, rather supportive therapies like hydration, possible short-term dialysis and addressing the injury cause. Even without an acute kidney injury, the heavy burden of glucose and inflammation that comes with diabetes causes related kidney damage in about a third of patients in about 15 years of living with the disease. The ceaseless filtering and reabsorption work of the kidney gets overwhelmed with the extra glucose, which can increase oxidative stress, prompt sugars to start binding to proteins, which can reduce their function, and inflammation becomes chronic and destructive. In fact, diabetes and high blood pressure are the leading causes of kidney failure in the United States, according to the National Kidney Foundation. Dong's team has evidence that diabetes makes people more susceptible to an acute kidney injury from which they don't recover well, which ties back full circle because an acute injury also increases the chronic kidney disease risk. The bottom line is that in this so-called "comorbid" state, patients are at heightened risk for significant kidney damage, even kidney failure. His team focuses on the acute injury piece of this interrelated health dilemma and the reality that treatment for acute kidney injury hasn't really improved after a half-century search for good therapies, Dong says. That's why he is looking for targets and therapeutic agents. Blood enters the kidneys through clusters of small blood vessels called glomeruli. We have more than a million of these filtering units that each connect to a collecting tube called a tubule, which passes waste along to the bladder for elimination. Tubular cells also daily resorb nearly 50 gallons of usable items, including salt and glucose the kidneys filter from the blood. They typically resorb 80-90 percent of the glucose. In their effort to maximize autophagy in the face of higher glucose, Dong and his team are delineating how diabetes reduces autophagy with the idea of restoring this innate ability when a patient is also bombarded with an acute kidney injury. They have their sites on some of our smallest RNA. They have evidence that activity of ULK1, an enzyme and key initiator of autophagy, is reduced in the kidney both in diabetes and also by putting a lot of glucose directly on kidney cells. MicroRNA, or miRNA, generally suppress expression of their target genes, and Dong's team also has evidence that in diabetes, expression of at least one miRNA is increased, which, in turn, decreases ULK1 expression and autophagy. Right now they don't know a lot about its functions, but high levels are associated with overgrowth of tubules and thickening and scarring of the kidney. Also up in diabetes is p53, a known tumor suppressor that can help assess damage to a cell, help drive its repair if possible and its suicide if it's not. In a healthy cell, p53 levels are low. Higher levels of p53 are associated with lower levels of autophagy and Dong has shown p53 is even more highly activated with an acute kidney injury, likely to help kill off freshly injured cells. "Autophagy is generally a protective mechanism, so as this protective mechanism goes down, an injury mechanism goes up," Dong says of this inverse relationship. He thinks his miRNA is essentially the middleman with p53 signaling for it to reduce autophagy and it responding by turning down expression of the ULK1 gene. That pivotal role makes the miRNA a likely and probably amenable drug target, he says. "We need to find a way to make it go down," Dong says. "Maybe if we can normalize autophagy a little better we can help kidneys survive this period." The new grant is enabling them to sort the details of how p53 induces the miRNA in diabetic kidneys, how it, in turn, suppresses ULK1 and autophagy and, finally, how reduced autophagy makes the kidneys more vulnerable to injury. This shift is likely what makes a patient with diabetes more vulnerable to acute kidney injury. Another thing they are exploring further is what happens to cell death rates, but Dong has already watched tubule cells become less efficient and die. He's also now exploring the relationship between reduced autophagy and increased inflammation. Diabetes is a common, chronic stressor of the kidney, Dong says. And he expects other common stressors, like the all too common hypertension, make some of the same unhealthy adjustments to tubule cells. In fact, he is collaborating with China's Central South University with the idea of delineating the autophagy pathway in a hypertension model as well. 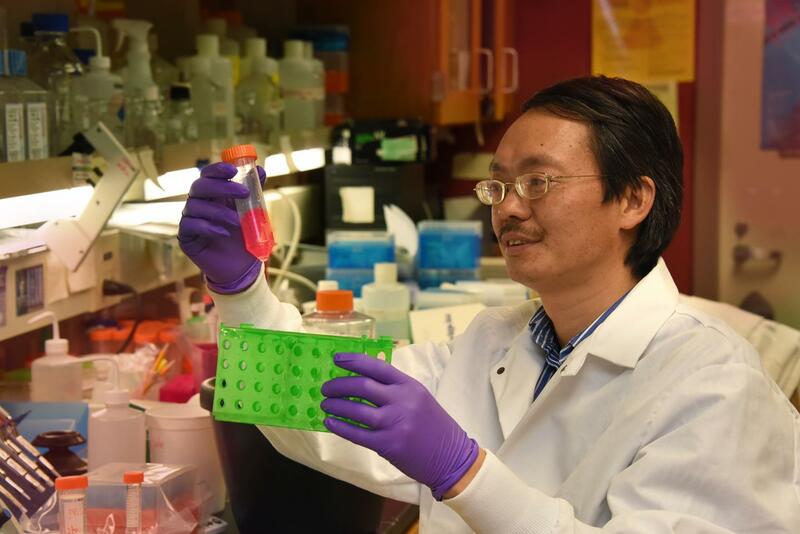 Dong's research on kidney injury has been continuously funded by the National Institutes of Health since 2000. A study published in 2009 in the Clinical Journal of the American Society of Nephrology found that 49 percent of patients with chronic kidney disease who had a severe acute kidney injury were in renal failure within 30 days after leaving the hospital compared with 1.5 percent in those who did not experience the acute injury.